What did the rest of Australia ever do to the voters of Warringah? Lucky to live in one of the most blessed constituencies on earth, stretching from Sydney’s leafy north shore to the northern beaches, its residents have nevertheless foisted on Australia the single most destructive politician of our time: Tony Abbott. The failed priest, nicknamed the “mad monk”, has done incalculable damage to this country. And for someone who aspired to be a “junkyard dog savaging the other side”, Abbott has lately mostly savaged his own, culminating in last week’s Pyrrhic victory over Prime Minister Malcolm Turnbull, which slaked his thirst for revenge but left the Liberals in their worst position for a decade. As a former director of Australians for Constitutional Monarchy, Abbott was a key wrecker of the 1999 republic referendum, denying this country a head of state who was one of us. Abbott employed David Oldfield, who moonlighted for Pauline Hanson and helped create One Nation. Realising the threat that Hanson posed to the Liberals’ right front, Abbott was the brains behind shabby outfit Australians for Honest Politics, which helped put her in jail for electoral fraud. As a pro-life health minister, under John Howard, he tried to block women’s access to the abortion drug RU486. In 2009, Warringah’s local member tore down Liberal Opposition leader Malcolm Turnbull over climate change. It was desperately cynical even then: Abbott admitted to Turnbull at the time that he’d been a “bit of a weather vane” on the issue. But Abbott decided it was “absolute crap” that the science of climate change was settled and, right there and then, introduced a kind of madness into our politics. Ever since, the country has found it impossible to agree on an energy or climate policy. Emboldened after toppling Turnbull, the member for Warringah went on to launch a misogynistic campaign against our first female prime minister; he also embarked on a misleading “axe the tax” campaign against Labor’s emissions trading scheme, which his chief of staff, Peta Credlin, later excused as an exercise in “brutal retail politics”, given the ETS wasn’t a carbon tax at all. As prime minister, Abbott’s first great achievement was to kill off our car industry, and he went on betray his promise to the electorate that his government would make “no cuts to education, no cuts to health, no change to pensions, no change to the GST and no cuts to the ABC or SBS”. His first budget in 2014, possibly the worst in living memory, defunded schools and hospitals to the tune of $80 billion compared with forecast funding levels under Labor, and failed to pass the Senate. 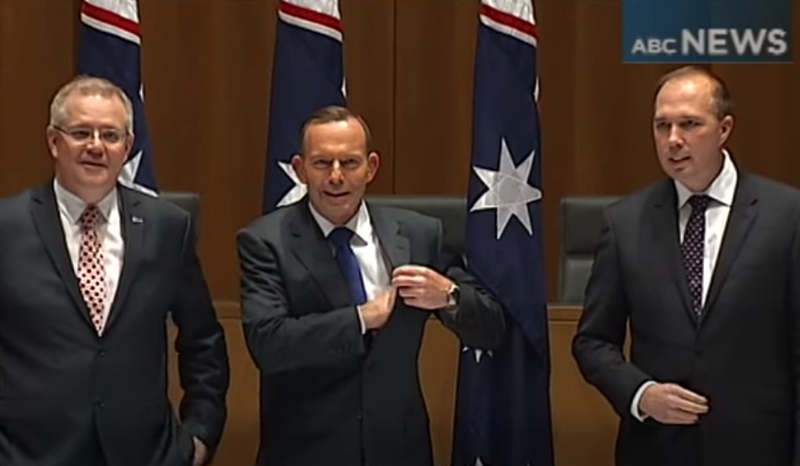 That year Abbott made Australia the first country in the world to abolish a carbon price. Then in 2015 he knighted Prince Philip on Australia Day, turning himself into a laughing stock, and his downfall began. When the Liberal Party turfed Abbott in September 2015, a grateful nation rewarded the new PM Turnbull with approval ratings of 68 per cent. Ever since, Abbott has sniped, wrecked and undermined the Coalition. Although he describes his aim as being the “best possible member for Warringah”, he has never cared to represent his constituency faithfully. In the equal marriage postal survey, 75 per cent of his electorate voted “Yes” – the highest proportion in New South Wales – but Tony Abbott, a loud “No” campaigner, later scarpered from the House of Representatives. Now, without care for the national interest, the institution of parliament, the office of PM or the electoral fate of the Liberal Party, Abbott has torn down Turnbull a second time. To what end? Not policy: Turnbull had conceded everything the hard right demanded of him. Not politics: today’s Newspoll [$] shows the damage caused by last week’s spill; the Coalition now trails Labor 44–56, and Bill Shorten is preferred PM. The member for Warringah will reportedly [$] give a “call-to-arms” speech to rally Liberal members behind new prime minister Scott Morrison. But can Abbott be trusted to serve Morrison loyally? Or will he start the work of tearing down another Liberal prime minister? Abbott has been left out of the ministry, being offered instead a role of special envoy to the PM on Indigenous affairs. He is today complaining: “I don’t just want a title without a role.” Abbott, who considers himself “a young 60”, is not going anywhere of his own volition. The voters of Warringah, who have only ever elected a Liberal, will have to do it for him. They have a historic opportunity – if not a responsibility – to remove this one-man plague on the nation from politics, once and for all. 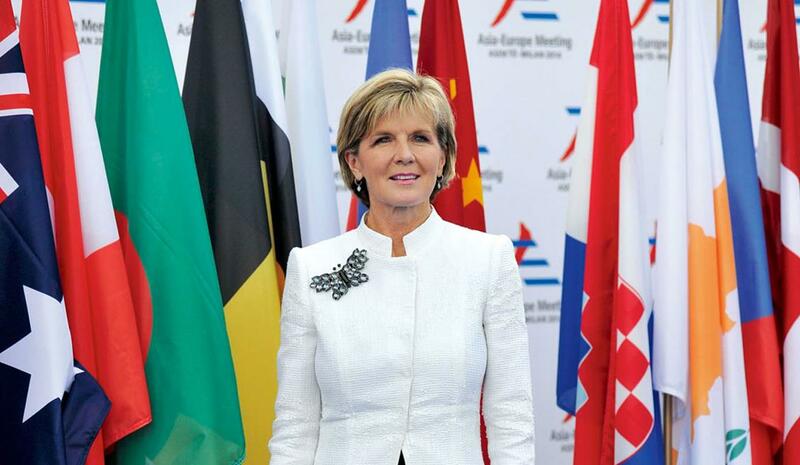 The Australian reports [$] that Julie Bishop’s move to the backbench has furthered speculation that she may soon use her considerable skills in diplomacy as an ambassador or as the next governor-general. City of Sydney councillor Christine Forster, Tony Abbott’s sister, has confirmed her intention to nominate for Liberal preselection for former prime minister Malcolm Turnbull’s seat of Wentworth in Sydney’s east. In an exclusive, the AFR’s Phillip Coorey reports that in a meeting last week with Mathias Cormann, Michaelia Cash and Mitch Fifield, former prime minister Malcolm Turnbull described the week’s events as “terrorism”, and the trio agreed. Newspoll shows [$] that the two-party-preferred split between Labor and the Coalition has blown out, from 49–51 in favour of Labor a fortnight ago to 44–56 now. The AFR reports [$] that NAB will fight damning findings by counsel assisting the banking royal commission that its behaviour was “ethically unsound” and that it demonstrated a disregard for superannuation fund members, regulators and the law. Fairfax Media reports that Prime Minister Scott Morrison has vowed to “change the culture” of his government to end conflict and infighting, using a careful cabinet reshuffle to reward allies while restoring key rivals to power. According to Fairfax Media, university leaders are picking up major pay rises, taking the annual average salary of vice-chancellors in New South Wales and Victoria to just below $1 million.